Teaching a subject always challenges you and even though I have now been teaching the power training principles for 7 years, I always enjoy teaching seminars and really enjoy teaching them abroad. Bringing new knowledge to a place and to a group of people that really, really want it is just a joy. I had that experience in late April, when I traveled to New Zealand. I taught three separate seminars, one in Auckland to coaches and athletes and then two in Christ Church on the south island to the elite coaches of Bike NZ and then to the top coaches of Tri NZ as well. None other than six different former Olympians were in attendance at the seminars and two former World Champions as well, which was quite an honor to present to such an esteemed audience. In each seminar, I always learn something new and these were no exception. Putting great minds in a room always causes some great ideas to spring forth. One coach, Silas Cullen, had a particularly good idea that I’ll share with you. I was teaching how to use the “Fast Find” feature in WKO+ software and using it to find “matches” burned in a race. In using the Fast Find, you put the “leading edge” wattage on the watts that you want to find and the software selects a wattage over that number and continues to select it until you specify a wattage number to de-select it in the “trailing edge”. In this manner, you can identify hard efforts and see just exactly when you might have “cracked” in a race or training. After teaching about Multi-File Range Analysis and demonstrating how to overlay time trial files on top of each other, Silas asked me if there was a way to identify a certain wattage in a file that you stayed under. We were discussing the importance of pacing in a time trial and how so many athletes ride too hard in the beginning of a time trial. So Silas wondered if you could identify how well an athlete did at staying under a certain wattage. Bells started going off in my head and I thought, “well, we can identify periods of time over a certain wattage, why can’t we just reverse the leading and trailing wattage numbers in “Fast Find” and then use that?” However, that’s not how the “Fast Find” feature was designed to be used, so we need to ask the question, when did the athlete exceed a certain wattage and for how long? In the time trial below I gave the athlete a specific wattage parameter to hold for the event and asked him to hold between 300 and 330 watts for the TT. 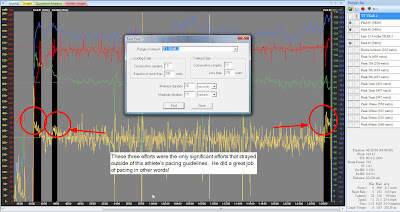 By placing the leading edge on 300 watts and making the consecutive samples 10 (since we really only want to see significant time over 330) and then the trailing edge on 330 with 10 consecutive samples as well, this then instantly finds all periods of time in which he did not hold to that wattage pacing guideline. In this case, it was only three times of which two were in the beginning of the TT when he got up to speed and then at the end when he pushed for the finish line. Figure 1. Example of using "Fast Find" in WKO+ to identify periods when athlete exceeded their wattage goal. While this might not be anything new to you, it’s a nice way of finding those outliers in a time trial that might have contributed to poor pacing. In this case, our athlete did a superb job of pacing. Use “Fast Find” to find your outliers! Thanks Hunter, great tip. Can you link the pictures so they can open up, if it's not too much trouble? Very difficult to examine pics. I second the above, the chart is not readable. Nice insight for TTing. Thank you.